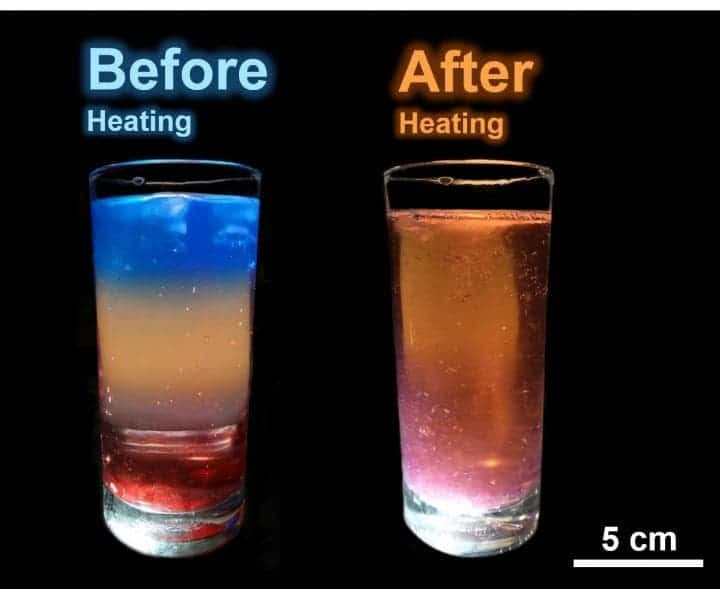 Galaxy cocktail before and after heating. Credit: Xiaolei Wang. Most birth control methods are geared towards women, whether it’s a hormonal contraceptive such as “the pill” or more invasive methods like implants or intrauterine devices. For males, there are basically really only two vetted forms of contraception: condoms and vasectomy. Condoms are effective over the short-term, but they can lead to unwanted pregnancies when they break or are handled improperly. Vasectomies are effective over the long-term, however, they’re not always reversible. This is why research groups are developing and testing all sorts of new methods. The most recent notable attempt at a male contraceptive comes from China — and it was inspired by an enchanting colored cocktail. Bartenders prepare the Galaxy by layering various types of liquids, which become a homogenized solution only when stirred or heated. The team of researchers at Nanchang University led by Xiaolei Wang used a similar approach and injected separate layers of substances in order to block the vas deferens — the duct that carries sperm from the testicles to the urethra. When the materials were injected into male rats, pregnancies were avoided for more than two months. At the end of this period, the researchers shined a near-infrared lamp on the rats for a few minutes, which caused the layers to mix and dissolve. The animals then produced offspring when they copulated, the authors reported in the journal ACS Nano. Before anyone gets too excited, this is just a pilot experiment which will require further testing for safety. After all, the concoction doesn’t sound particularly risk-free: a hydrogel that physically blocks sperm; gold nanoparticles; ethylenediaminetetraacetic acid (EDTA), a chemical that breaks down the hydrogel and also kills sperm; and a final layer of gold nanoparticles.